David II Of Dundaff GRAHAM was my 25th Great Grandfather through the through the lineage of Mini HaHa DAVIS the wife of James Elwood SEE, my Great Grandfather. THE monkish writers allege that the Grahams can trace their descent from a fabulous personage called Grame, who is said to have commanded the army of Fergus II. in 404, to have been governor of the kingdom in the monarchy of Eugene, and in 420 to have made a breach in the wall erected by the Emperor Severus between the Firth of Forth and the Clyde, and which was supposed to have derived from the Scottish warrior the name of Græme's Dyke. The 'gallant Grahams,' as they are termed in Scottish ballad and song, do not require the aid of fable to increase their fame, for few of our great old houses have such an illustrious history. Like most of the ancient Scottish families, the Grahams are of Anglo-Norman origin, and they settled in Scotland during the twelfth century. The first of the race whose name occurs in the records of Scotland was a Sir William de Gnæme, who received from David I. the lands of Abercorn and Dalkeith, which descended to Peter, the elder of his two sons. Peter's grandson, Henry, by his marriage to the heiress of the family of Avenel, acquired their extensive estates in Eskdale. He was one of the magnates Scotia who, in the Parliament of 5th February, 1283-4, bound themselves by their oaths and seals to acknowledge as their sovereign the Princess Margaret of Norway, the grand-daughter of Alexander III., in the event of that monarch's death without male issue. His son, Sir Nicholas, was one of the nominees of Robert Bruce when, in 1292, he became a competitor for the crown. His grandson, Sir John de Graham of Dalkeith, who died without issue, was the last of the original stock of the family. His estates were divided between his two sisters: the elder, who married William More, inherited the lands of Abercorn; the younger became the wife of William Douglas of Lugton, ancestor of the Earls of Morton, and conveyed to him Dalkeith, and the estates of the Avenels in Eskdale. The male line of the family was carried on by John, the younger son of Sir William de Graham. Among the muniments in the possession of the Duke of Montrose there is a charter by William the Lion, probably of the date of 1175, granting to David de Graham, second son of John, the lands of Kynnabre, Charlton, and Barrow-field, in the county of Forfar, and of the fishing of the Water of Northesk. A few years later the same monarch bestowed upon Radulph of Graham the lands of Cousland, Pentland, and Gogger, in Midlothian. Alexander II. in 1227 confirmed a grant made by Patrick, Earl of Dunbar, to David de Graham (who must have been the son of the first mentioned David), of the whole waste lands of Dundaff and Strathcarron, which was the King's forest, in exchange for the lands of Gretquerquer, in Galloway. Conditus hic Gramus, bello interfectus ab Anglis. From this time downwards the Grahams have taken a prominent part in public, and especially in warlike, affairs. The son of Sir David, who bore his name, which seems to have been a favourite one among the early Grahams, was a zealous adherent of Robert Bruce, and defended the independence of his native country so stoutly, that he was excepted from the pacification which King Edward made with the Scots in 1303-4. Along with two of his kinsmen, he signed the famous letter to the Pope vindicating in noble terms the independence of Scotland. He died in 1327. It was he who exchanged with King Robert Bruce the estate of Cardross for Old Montrose. His son, also named Sir David, was taken prisoner with his sovereign, David II., at the battle of Durham. Sir David's son, Sir Patrick of Graham, was the ancestor both of the Montrose and Menteith Grahams. His son and successor, by his first wife, Sir William, carried on the main line of the family. His eldest son, Patrick, by his second wife, Egidia, niece of Robert II., married- probably about the year 1406-Eufemea Stewart, Countess Palatine of Strathern, and either through courtesy of his wife, or by creation, became Earl Palatine of Strathern. The elder son of Sir William Graham by his first wife predeceased him, leaving two sons. 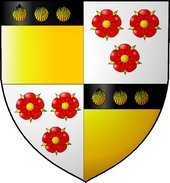 By his second wife, the Princess Mary Stewart, daughter of Robert II., Sir William had five sons, from the eldest of whom descended the Grahams of Fintry, of Claverhouse, and of Duntrune, and the third was the ancestor of the gallant Sir Thomas Graham, Lord Lynedoch. Patrick Graham, Sir William's second son, by the Princess Mary, was consecrated Bishop of Brechin in 1463, and was translated to St. Andrews in 1466. He was a learned and virtuous prelate, worthy to succeed the illustrious Bishop Kennedy, his near relative-a model bishop. Anxious to vindicate the independence of the Scottish Church, over which the Archbishop of York claimed jurisdiction, he visited Rome, and procured from the Pope a bull erecting his see into an archbishopric, and appointing him metropolitan, papal nuncio, and legate a lalere, in Scotland for three years. On his return home the Archbishop was assailed with vindictive malignity by his ecclesiastical rivals. The inferior clergy rejoiced in his advancement; but the dignitaries of the Church, through envy and dread of the reforms which he was prepared to inaugurate, became his inveterate enemies. By bribing the King, James III., they succeeded in obtaining the degradation and imprisonment of the unfortunate prelate, on the plea that he had infringed the royal prerogative by applying to the papal court without the King's license. It is alleged, in a report recently found in the Roman archives, that Graham had proclaimed himself divinely appointed to reform ecclesiastical abuses, and had revoked indulgences granted at Rome, appointed legates, and had committed other similar illegal acts. There is reason to believe that the persecution which the Archbishop underwent had affected his mind. Schevez, an able, but unprincipled and profligate ecclesiastic, who succeeded Graham in the primacy, and was the leader of the hostile party, had him declared insane, and procured the custody of his person. He was confined first in Inchcolm, and afterwards in the castle of Loch Leven, where he died in 1478. Sir William Graham was succeeded by his grandson, PATRICK GRAHAM of Kincardine, who was made a peer of Parliament in 1451, under the title of LORD GRAHAM. His grandson, WILLIAM, third Lord Graham, was created EARL OF MONTROSE by James IV., 3rd March, 1504-5. His title, however, was not taken from the town of Montrose, but from his hereditary estate of 'Auld Montrose,' which was then erected into a free barony and earldom. He fell at the battle of Flodden, 9th September, 1513, where he and the Earl of Crawford commanded one of the divisions of the Scottish vanguard. One of the younger sons of the Earl by his third wife was the ancestor of the Græmes of Inchbrakie. WILLIAM, second Earl of Montrose, held several offices of trust in connection with the person of the young king, James V., and his daughter, Queen Mary. JOHN, third Earl, was one of the most powerful noblemen in Scotland in his own day, and was deeply involved in the plots and intrigues of the early part of the reign of James VI.. He assisted the profligate Earl of Arran in bringing the Regent Morton to the block, which led to a feud between him and the Douglases. He twice held the office of High Treasurer of Scotland, and was appointed Lord Chancellor in 1599. After the accession of James to the throne of England, the Earl was nominated Lord High Commissioner to the Parliament which met at Edinburgh, 10th April, 1604. On resigning the office of Chancellor, a patent was granted to him by the King, in December of that year, appointing him Viceroy of Scotland for life, with a pension of £2,000 Scots. He presided at the meeting of the Estates at Perth, 9th July, 1606, which passed the ecclesiastical enactments termed the Five Articles of Perth, so obnoxious to the Presbyterian party. At his death in 1608, the King thought fit to order that the Earl, in consequence of his high position, should be buried with peculiar pomp and splendour, and promised to give forty thousand merks to cover the expense. But the promises of James in regard to pecuniary matters were not often performed. The money was never paid, and the costly funereal ceremonial imposed a heavy burden on the Earl's son. JOHN GRAHAM, fourth Earl of Montrose, showed, by an incident mentioned in Birrel's Diary, that in his youth the hot blood of the Grahams ran in his veins, though in his mature years he was quiet, peaceful, and prudent in his conduct. '1595, the 19th January, the young Earle of Montroes [at this time he was only Lord Graham] fought ane combate with Sir James Sandilands at the Salt Trone of Edinburgh, thinking to have revengit the slauchter of his cousine, Mr. Johne Graham.' This Earl lived the retired life of a country gentleman, and seems to have been very domestic in all his habits. It appears from the family accounts that he amused himself with archery and golfing, and indulged a good deal in the use of tobacco. He was appointed President of the Council in July, 1626, and died 14th November of the same year, in the prime of life. But his burial was not 'accompleissit' until the 3rd of January, 'and the haill friends remainet in Kincardin thereafter, sateling his Lordship's affairs, till Soinday, the 7th of January.' An account-book which has been preserved shows the enormous expense that was incurred in 'accompleissing' the burial, and in entertaining for eight weeks the array of kinsmen who had congregated in the family mansion to do honour to the obsequies of the deceased nobleman. They feasted upon 'Venison, Beif, Muttoune, Lamb, Veill, Geis, Caponis,' and other poultry; and of game and wildfowl 'Capercailzies, Black Cokis, and Ethe henis, Termaganis, Muir foulls, Wodcoks, Peitrecks [partridges], Plewvers, and Birsall foulls,' in great abundance. Of liquors there were consumed one puncheon of 'claret wyn' and one puncheon of 'quhyt wyn,' besides nine gallons of 'Ester aill.' This protracted hospitality and costly mode of performing funerals may account for the sumptuary laws frequently enacted by the Scottish Estates, for the purpose of limiting the ruinous expenses incurred on such occasions. No less than three years' rental of the estate of the deceased has sometimes been spent in 'accompleissing' his burial. After Montrose left Aberdeen, Lord Aboyne, at the head of a strong body of Highlanders, obtained possession of the town, evidently with the consent of the citizens, and the Covenanting general was a second time dispatched to this stronghold of the Episcopalians and Royalists, which the Highlanders evacuated on his approach. He treated the inhabitants with most unjustifiable severity, levied on them a contribution of ten thousand merks, pillaged their houses, carried off or destroyed their corn, and plundered both the fishermen of the town, and the farmers and peasantry of the adjacent country. Montrose then marched westward to attack the strongholds of the Gordons, but retraced his steps on learning that Aboyne had arrived with reinforcements, and had again taken possession of Aberdeen. The Highlanders, however, fled at the first discharge of the artillery of the Covenanting forces, and the unfortunate city once more fell into the hands of Montrose, who imposed a fine of sixty thousand merks sterling upon the citizens. No decided step, however, was taken by Montrose in opposition to Argyll until July, 1640, when the Covenanting army was encamped on Dunse Law. At that period a bond was privately offered for his signature, proposing that some person should be appointed captain-general of the country north of the Forth, and implying that this person should be the Earl of Argyll. Montrose indignantly refused to subscribe this bond, and, in conjunction with the Earls of Marischal, Home, Athole, Mar, and other influential noblemen, including Lord Almond, the second in command of General Leslie's army, he entered into what was called the Cumbernauld Bond, from the place where it was prepared, for their mutual aid and defence in case of need. This bond was speedily discovered by Argyll and his friends, and the subscribers were called to account for their procedure by the Committee at Edinburgh; but their formal renunciation of the bond was accepted as a satisfactory settlement of the affair. The confidence of the party, however, in Montrose was shaken, and, in June, 1641, he was accused of carrying on a secret correspondence with the King, and, along with three of his friends, was confined in the castle of Edinburgh. He remained a close prisoner there until the beginning of 1642, when he was set at liberty, on the intercession of King Charles himself. After the breaking out of the Civil War, Montrose, who greatly disliked the timorous and trimming policy of the Marquis of Hamilton, the King's minister for Scotland, urged that an army of Royalists should be raised at once, to prevent the Covenanters from making common cause with the English Parliament. 'Resist,' he said, 'resist force with force. The King has loyal subjects in Scotland; they have wealth, and influence, and hearts stout and true; they want but the King's countenance and commission. The only danger is delay. If the army of the Covenant be allowed to make head, loyalty will be overwhelmed. The rebellious cockatrice must be bruised in the egg. Physic is too late when the disease has overrun the body.' There can be little doubt that if Montrose had been permitted at this juncture to raise an army in behalf of the royal cause, the Covenanting forces could not have ventured to quit Scotland. But his advice, which was as sagacious as it was bold, was disregarded, and the result was that a powerful army, under General Leslie, was sent to the assistance of the Parliament, and turned the scale in their favour. On the ruinous failure of Hamilton's policy, and his consequent disgrace and imprisonment in the beginning of 1644, Montrose was appointed by the King Lieutenant-General in Scotland, and shortly after was advanced to the dignity of marquis. He made a daring attempt to cut his way into Scotland at the head of a small body of cavalry, with the view of raising the Scottish royalists on the side of the King, but was encountered on the Borders by a greatly superior force, and compelled to fall back on Carlisle. After the fatal battle of Marston Moor, however, he set out in August, 1644, in the disguise of a groom in attendance on two of his friends, Sir William Pollock and Colonel Sibbald, and succeeded in reaching the Highlands without detection. He found at Blair Athole two hundred Highlanders and about twelve hundred Irish auxiliaries, indifferently armed and disciplined, who had shortly before landed in the West Highlands under Alaster Macdonald, better known as Colkitto, [He was the son of Coil Keitache MacGillespic Macdonald of Colonsay. Keitache means left-handed.] to aid the royal cause. Montrose immediately displayed his commission from the King, and raised the royal standard. The Highlanders flocked to it in considerable numbers, and the Marquis, finding himself at the head of a powerful force, lost no time in directing his march to the low country. At Tippermuir, three miles from Perth, he encountered (1st September) an army of six thousand Covenanters, under Lord Elcho, whom he defeated, with the loss of three hundred men, and of all his artillery, arms, and baggage. Perth immediately surrendered, and the victors obtained from the terror-stricken citizens a seasonable supply of clothing and arms. The approach of Argyll at the head of a superior force compelled Montrose to leave Perth. The Highlanders in his army, according to their immemorial custom, quitted his standard and returned home to secure their spoil. The murder of Lord Kilpont still further diminished his army, as the followers of that nobleman left the standard, to convey the body of their chief to the sepulchre of his ancestors. With a force reduced to less than two thousand men, Montrose proceeded northward to Aberdeenshire. Here, at the Bridge of Dee, he encountered and defeated another army of the Covenanters, under Lord Burleigh and Lord Lewis Gordon, one of the sons of Huntly, and pursued the fugitives into the town of Aberdeen. That ill-fated town was given up to pillage, and suffered cruelly from the excesses of Montrose's Irish troops, who put to death without mercy all whom they found in the streets. In some instances they even compelled their victims to strip before they killed them, lest their clothes should be soiled by their blood. 'The women durst not lament their husbands, or their fathers slaughtered in their presence, nor inter their dead, who remained unburied in the streets until the Irish departed.' It has been justly said that the people of Aberdeen had a right to expect very different treatment from an army fighting under the royal banner, for they had always been favourable to the cause of the King; and Montrose himself, when in the service of the Covenanters, had been the agent in oppressing, for its devotion to the royal cause, the very city which his troops so cruelly plundered, on account of its enforced adherence to the Parliament. On the approach of Argyll at the head of a superior force, Montrose proceeded up the Spey; then doubling back, he plunged into the wilds of Badenoch, and thence into Athole, always pursued, but never overtaken by the enemy. 'That strange coursing,' as Baillie terms the series of marches and countermarches, 'thrice round about from Spey to Athole, wherein Argyll and Lothian's soldiers were tired out, and the country harassed by both, and no less by friends than foes, did nothing for their own defence.' Completely tired out by these rapid and harassing marches, Argyll returned to Edinburgh, and resigned his commission as general, declaring that he had not been adequately supported. It was supposed that Montrose would remain until the spring in the district of Athole, but having obtained a strong reinforcement of Macdonalds, Stewarts of Appin, and other Jacobite clans, he resolved to attack Argyll in his native fastnesses. Guided by a clansman of Glencoe, who declared that there was not a farm, or half a farm, under Maccallum More but he knew every foot of it, Montrose made his way into Argyllshire, through paths hitherto deemed inaccessible, and plundered and laid waste the whole country with merciless severity. Dividing his forces into three bodies, in order to make the work of devastation more complete, he traversed the whole of the devoted district for the space of a month, killing the able-bodied men, driving off the flocks and herds, and laying the houses in ashes. As Spalding says, 'He left no house or hold, except impregnable strengths, unburnt; their corn, goods, and gear; and left not a four-footed beast in Argyll's haill lands; and such as would not drive they houghed and slew.' The thirst of feudal vengeance, it has been justly said, may explain, but can in no degree excuse, these seventies.